Buy two get one FREE, Promo ends this Saturday October 18th. 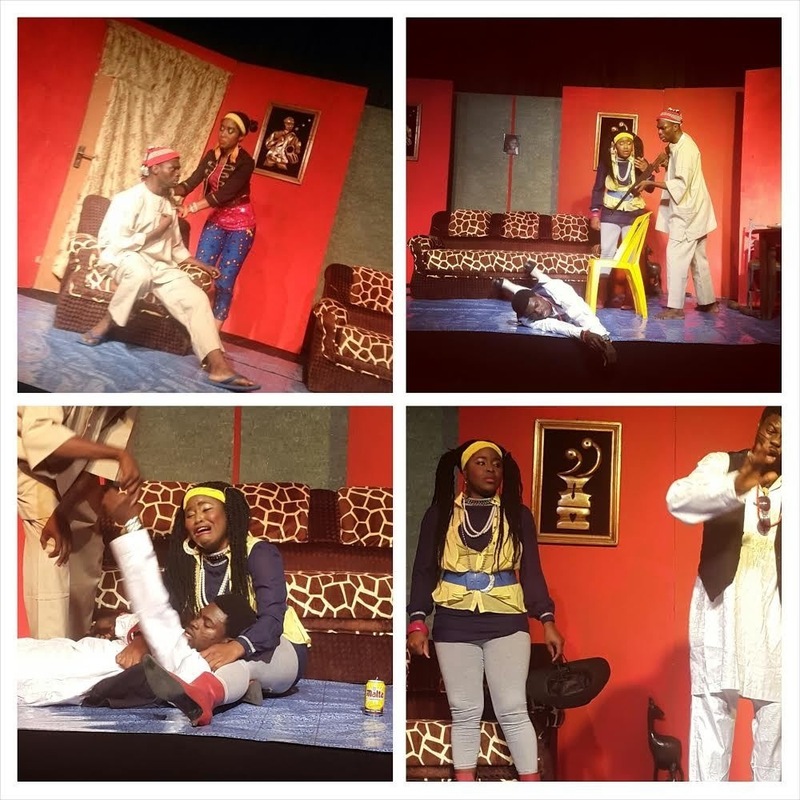 Watch Nneka beat up Ladoja as he tries to ask for her hand in Marriage. Ladoja has a running case of diarrhea, Nneka still claims she is 16 years old and Evans’ her dodgy Father thinks he died and went to hell. Venue: Terrakulture plot 1376 Tiamiyu Savage Street off Ahmadu Bello Way V I. Watch the video “My Name My Identity” here. in Soprano High or Bass deep. Oh! It jars your ears. (beat) I should shorten it? A letter. And call it a nickname. So that you might feel it? My name is my identity. History of valiant Yoruba men and women in battle. My name is their victory. My name is history of a generation. I lose it; we lose a story. My name is a symbol. A symbol that rises early in the morning when my mother screams: Fe-mi. It’s a sign of control, of power. I don’t need to show it. It shows me. I don’t have to shout it. It shouts me. Let me wear it as I want. Oruko mi ni Olorunfemijuwonlo Amogunla. What is your own name? This thematic focus of this poem is the beauty of Yoruba/African culture as captured in the significance of a name, of my name. An African traditional name is more than just a name; it is more than just something we are called by or something that differentiates us from another. In fact, in the Yoruba belief system, what you are called, and how you are called goes a long way to affect what you turn out to be. In essence, African names define our cultural identity, lineage and on several occasions, the circumstances in which we lived and currently live. In this award winning project by Femi Amogunla, he insists that he should be called by his name, the way it should be; not as an abbreviation or as a nickname because, it is believed that “whatever” you are called has a meaning. The poet draws on personal examples of the challenges that he has faced when it comes to his name, and draws on how he has been able to keep bearing his name despite these. The poem also goes ahead to show the challenges of holding on to this culture of naming in a fast changing world that seems to impose its change on one. The narrator refuses any other version of his name, and takes pride in what he’s called. Rendered in English, this poem has a universal appeal, yet it is sprinkled with local Yoruba language, the poet calls the audience to a different language, to a different culture. It also makes use of accepted codes of culture like music. Finally, it educates others about African lives, African pride and the struggle of the African past. Check out our previous post on Femi Amogunla here. 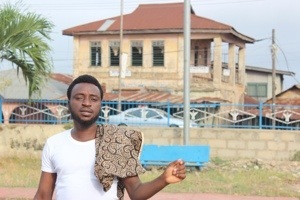 From the groundbreaking 30 Nigeria House project, a young voice in traditional Yoruba poetry, evoking the rhythms of timeless wisdom, sings itself into the okan (heart) of African poetry. His name is Femi Amogunla. 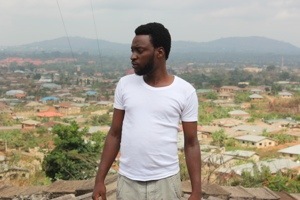 Femi on NTA hilltop, Ile Ife, Osun state, for location check. Photo by Ogunniyi Temitope. 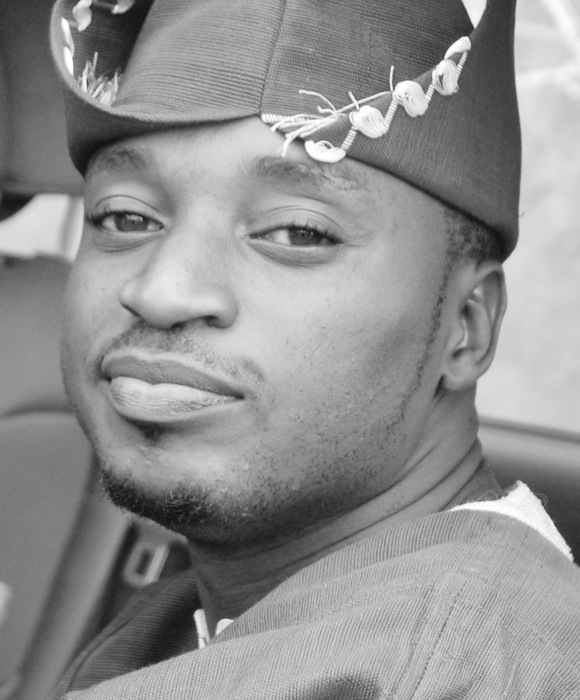 Femi Amogunla is an actor, spoken word and voice-over artist based in Ibadan, Nigeria. He studied English Language at the Obafemi Awolowo University, after which he proceeded to the Royal Arts Academy for a Diploma in Acting where he graduated as the best acting student. 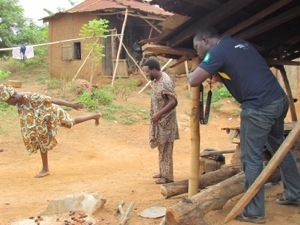 Performance is one word with many meanings for Femi; many of them, he loves. 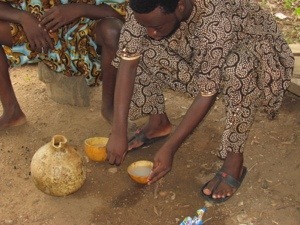 Femi at Oranmiyan park, Ile Ife. Photo by Ogunniyi Temitope. In June of 2012 Femi was selected as one of 30 award winners for the prestigious 30 Nigeria House project, an initiative of Theatre Royal Stratford East and New World Nigeria. 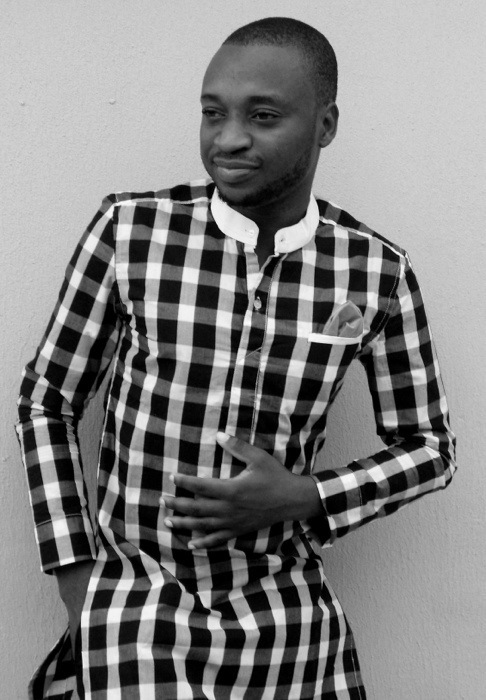 His project has seen Femi develop a spoken word piece titled: My Name, My Identity. The poem My Name, My Identity focuses on the beauty of Yoruba culture as captured in the significance of a name, in this case, Femi’s name. In the Yoruba belief system, what you are called and how you are called goes a long way to affect what you turn out to be. The narrator of the poem insists that he should be called by his name, the way it should be; not as an abbreviation or as a nickname because, it is believed that ‘whatever’ you are called has a meaning. Poetry makers. Photo by Ogunniyi Temitope. The poem also goes ahead to show the challenges of holding on to this culture of naming in a fast changing world that seems to impose its change on one. The narrator refuses any version of his name, and takes pride in what he’s called, drawing from the Yoruba culture and history. Rendered in English, this poem has a universal appeal, yet it is sprinkled with local Yoruba language, the poet calls the audience to a different language, to a different culture. It also makes use of accepted codes of culture like music.Finally, it educates others about African lives, African pride and the struggle of the African past. 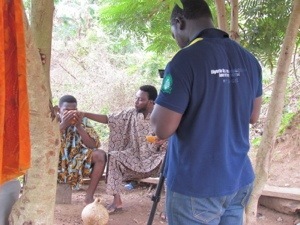 Speaking about the filming of this poetic piece Femi notes the project exposed him to “varied experiences”. 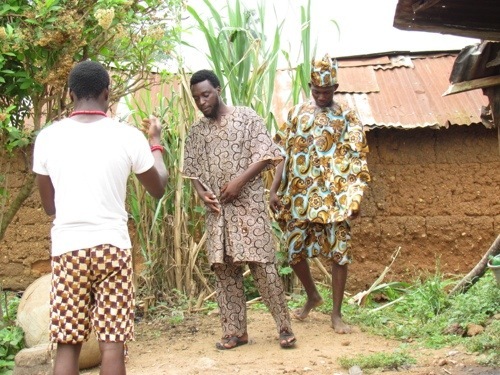 Shot in locations in Ile Ife, Osun State, the project took about three months to go through the lifecycle of pre-production to production to post-production. In order to fully capture the resonance of the poetry, audio was done separately from the shoot and as the poet puts it “that alone was hard work”. This being the first video shoot of his poetry, Femi says with a reminiscent smile, “I learnt so many lessons from the experience. It is one that I would gladly repeat. Now, I look forward to more recordings of my work”. Sometimes it can take an entire village to see a project such as this grow from seed to fruition, that makes nothing more encouraging than working with a crew who give the best to the task. Speaking of the crew Femi says: “my director, Imole Adisa who is also the creative director of The Masque Troupe did a wonderful job. The bata dancer Folusho Elujoba is a force to reckon with. 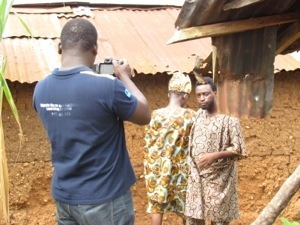 Also the effort of the cinematographer, Mayowa Olajide, who also doubled as the editor cannot be over emphasised. 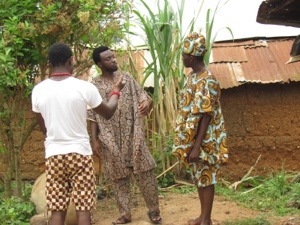 My costumier was Soji Gbelekale, so you know where the colourful traditional attires came from. The words all flow into one lovely poem and that’s thanks to Temitayo Olofinlua, the content director; she took the idea from the first draft and transformed it into a great poem. Folusho in motion. Photo by Ogunniyi Temitope. “While leaving for location, I told my wife I should be home in four – maximum five – days. This was because I had everything set – or so I thought. My location manager and I kept exchanging mails and all of that to be sure we won’t be spending more than a week. 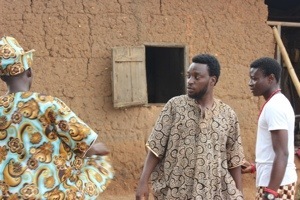 Director Imole Adisa (left) giving directions to Femi (center) and Folusho (right). Photo by Ogunniyi Temitope. When I got to Ile-Ife, the first challenge I had was getting appropriate time for rehearsals as the drummer, my director and even my cinematographer all had unexpected issues to attend to. We kept scheduling and re-scheduling until we got it done after three days. The first thing we did was to do the audio session. We booked an all-night session and that was tedious. One person did the drumming. There were three different drums. So imagine, each sound after the other. It was demanding. I had to do the recitation every time he picked an entirely different drum. The throat and the earth, they must be made wet with wine. Photo by Ogunniyi Temitope. After two days, we headed for location somewhere in front of the Oni of Ife’s palace only to be sent away by someone who claimed to be in charge of the place. Meanwhile my location manager had spoken to someone who also presented himself as being in charge of the place. All the shots we had before the intervention had to be cancelled. It was quite difficult getting a place to use eventually but in the end, it all went well”. Find out more about the 30 Nigeria House project here.. A.R.T is proud to be part of one of the projects under 30 Nigeria House, find out more here. About: District Officer Pilkings has a habit of sticking his nose in where it has no business, but then again so do most colonial masters. District Officer Pilkings, however, should know better than to stick his nose in the business of sacred traditional African rites. Customs demand that upon the death of Oba, the Horseman to the King must proudly end his earthly life and join his master in the life after. Elesin Oba is a proud man from a proud lineage who is unwavering in his belief and practice of his proud tradition. On what is to be his final day as a man Elesin Oba looks forward, with pride, to facing death. But District Officer Pilkings, he has a habit of sticking his nose in where it has no business. Thoughts: from the legend himself, this play exudes grandeur from cover to cover (and even some classic cockiness in the foreword from the author). Endeavour to look beyond the obvious conflict and you will find a deeper core conflict that expresses the raging battles of man with man, life, death, culture, mysticism, and the beyond.